June 4, 2013 | 8:38 a.m.
Attendees of the Association of Christians in the Mathematical Sciences (ACMS) biennial conference. The Association of Christians in the Mathematical Sciences (ACMS) held their biennial conference at Bethel University from May 29-June 1. More than 100 people attended the conference, which is held for mathematicians and computer scientists. Participants are from both Christian and secular colleges and universities as well as community colleges and high schools. “We usually have a number of foreign attendees – from Canada and Romania this year,” says Professor of Mathematics Eric Gossett, who coordinated the conference for ACMS. 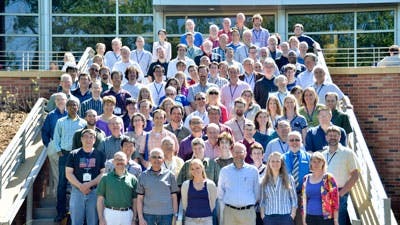 “This is the most significant association of post-secondary Christians in mathematics and computer science.” Gossett has been involved with ACMS since the 1980s and enjoys getting together with other Christians with similar academic backgrounds and academic jobs during the biennial conferences. “We can share ideas and reconnect with friends from past conferences as well as meet new attendees,” he says. Developed in 1976 as a way for mathematics instructors at Christian colleges to integrate their faith with their academic discipline, ACMS operated informally from 1976 to 1985 before the association was incorporated and opened to all in the mathematical sciences.